Clean air, fun friends, nature’s bounty, cool clime, warm people, adventure hub… the list can go on. This was how I experienced Manali in 2015 and 2016. All these things took me back to the place this year too. I was greeted with air that was heavy with vehicle smoke. I let it pass feeling that it is due to the tourist traffic during the summer vacations. I remember wearing a sweater in May last year. This time however, a cotton pullover felt warm. I missed the fan one night, as it got unusually hot. Slept through thinking it is a one off. On a walk along one of my favorite trails, I saw water pipes newly installed, jutting out from the side of a mountain. There was no structure to it either. It was clear that these were drilled through randomly to cater to the burgeoning tourist population. I couldn’t let this be. As if to confirm my worrying thoughts, a fellow traveller economist I met on this trip shared that the pace at which Manali is growing in a year, is something it should in 10 years. The speed is scary and unhealthy for the mountain town. More the people I met, more alarming stats came my way. A search for hotels showed me 733 hotels in Manali on a popular OTA. Rohit Verma, Business Development Manager, Cleartrip shared that Dubai has a similar number of properties! 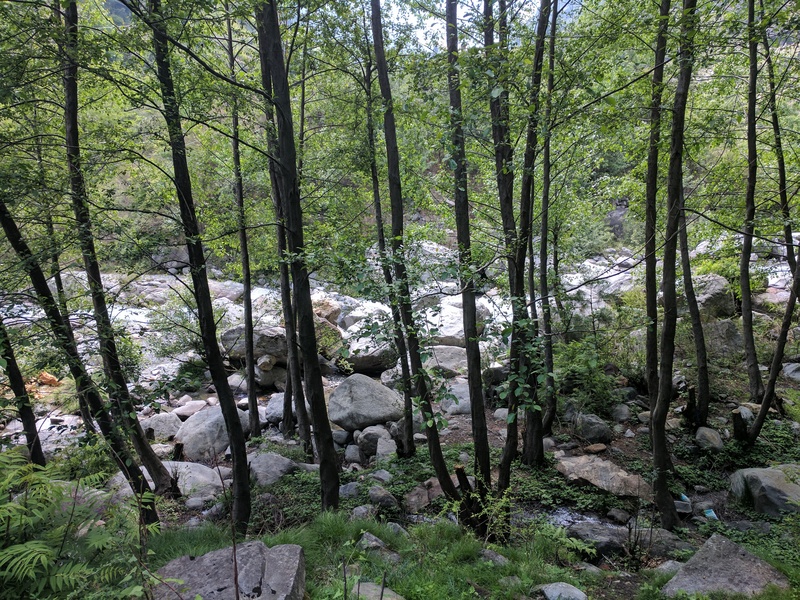 Inder Thakur, a professional climber, Co-owner of Himalayan Caravan Adventures shared that with a local population of approximately 10k people, the tourists are over 50k in Manali. All I could see now was the increasingly alarming state of my beloved Manali. I see the increasing concrete expanse as I walk. What were smaller, quaint homestays I adored earlier were now hastily adding floors to their structure. Projects are being undertaken to build concrete roads inside villages which have fertile farm lands. What will the impact of concrete be once it mixes with this nutrient rich soil? While walking along the trail, hearing the water gush over the rocks, I smell something unusual. I realise it is paint. The same paint we use in the cities. On the way back from a trek to Hampta, I see old wooden homes painted in all different oil paint colours. These were homes whose walls were lined with a mixture of dung, water, soil; a coat of this helped regulate temperature across seasons and act like an insulator when required. Manali is changing and being changed. I feel an urgent sense of panic. The climate is something we cannot directly control; but I know this – the way we host tourists is something we surely can control. It is tough to stop the spread of concrete and number of cars in urban spaces. That is why we take off for the mountains and beaches, to rejuvenate, as a respite from the heat or to relax. But without us realising, we are making our haven the hell we run away from ever so often. Restrict the number of tourists entering the town just like Bhutan. This will automatically reduce the air pollution. Let’s take cues from countries in Europe that have systems to build homes. Eg: Switzerland has rules with respect to the style and colour of windows that homes have. This will ensure the place continues to be picture perfect. A sewage system needs to be put in place with a lot of thought to water management and routing of pipes. Implement methods of urban farming and composting to tackle the problem of garbage disposal. This will avoid the garbage from flowing in the river. I would like to get together with others and put forward a proposal to the Government of Himachal Pradesh. I look forward to your ideas, suggestions and getting others to join the cause.